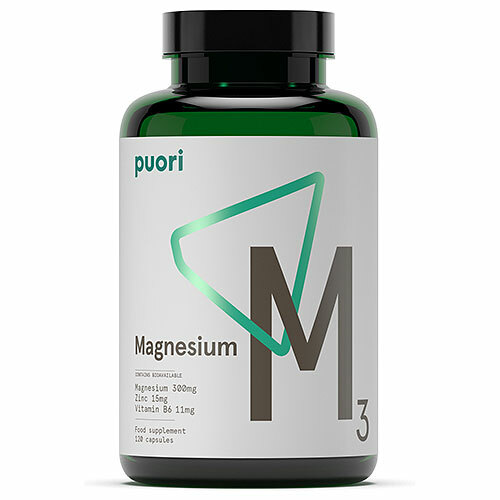 Puori M3 Magnesium in bioavailable form mixed with zinc, vitamin B6 and malic acid for optimal effect. Puori M3 is created using only the most absorbable organic forms of magnesium and zinc. Designed for restoring and replenishing depleted intracellular magnesium. Magnesium helps support normal electrolyte balance, energy yielding metabolism and muscle function plus it may help reduction of tiredness and fatigue. 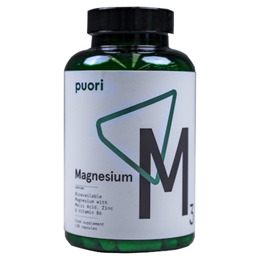 Only the most absorbable forms of magnesium and zinc combined with Puori`s proprietary absorption enhancer. The three essential ingredients work together to ensure that you get the most out of Puori M3. Minerals (Magnesium Taurinate, Magnesium Gluconate Dihydrate, Zinc Picolinate), Gelatin (Bovine), Malic Acid, Bulking Agent (Microcrystalline Cellulose), Anti-caking Agent (Magnesium Salts of Fatty Acids), Vitamin (Pyridoxine Hydrochloride (Vitamin B6)). Take 3 capsules daily, preferably 30 minutes before bed, or after exercise, or as recommended by a physician. Consult with a physician before using this product if you are pregnant, diabetic, allergic to iodine, using blood thinners, or anticipate surgery. Below are reviews of Puori M3 - Magnesium - 120 Capsules by bodykind customers. If you have tried this product we'd love to hear what you think so please leave a review. Great product for exercise recovery. Part of my routine supplement intake. I've been using this product for a couple of years now and whilst I don't notice any obvious changes which in truth I don't expect to I would say my sleep is certainly much better since I've been using this product. Thoroughly recommend. Having previously purchased this product from bodykind, I was offered the opportunity to receive a further product free of charge in return for writing an honest and unbiased review, which I have done.